Catfish: It's What's for Dinner | Flickr - Photo Sharing! She's bigger than the fish, but not by much. This was caught in a pond I have fished for years. The friend who owned it passed away last year. Prior to that, he had fed the catfish every evening, so they were not easily tempted to take anything on a hook. woof! Well, I can't eat those fish in particular, but that's a monster one! Now do tell, where's the pond, and do they have other fishes... and are they sneaksy? The pond is at 131st and XXXX, easy of hwy 75, but I'm sworn to secrecy as to the precise location. It is home to some decent bass, but lots of giant bluegill, which is what I was really after Sunday. Bluegill are ridiculously easy to catch on a piece of earthworm or a cricket. 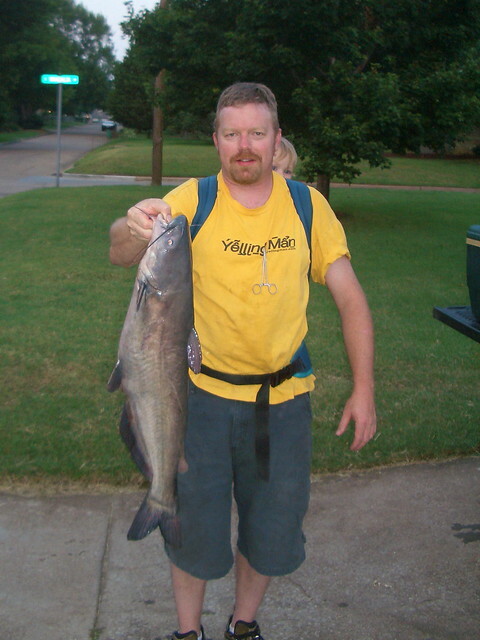 Take a look at www.wildlifedepartment.com/tulsafishing.htm for a list of places to fish in Tulsa. #4 is a particularly nice place to take the family, with a jogging track, picnic tables, and plenty of good fishing. How do you like that baby backpack? I have a lot of times where it'd be nice to tote Kat around while I did something requiring both hands, but I worry that she'd quickly become unhappy with riding and want down. Go out an buy one immediately. She begs to ride in it. It's the only place she will sit still (but I have to move) for a long time. She often falls asleep while I'm working and I don't even realize it for a while. Make sure you get one that keeps her head below yours. That way, if you duck under something, you know she's below the hazard as well. It is amazing how much you can get done with her strapped on. Short of mowing (noise, pollution) and gardening (she isn't comfortable when I'm on my hands and knees) there isn't much I can't do with her strapped on. I'll bet that was for dinner for several nights! aww..the baby behind is so cute..nice big fish, looks yummy. Nice Bluecatfish! fish fry on the way! Now that you mention it, it does look like a blue. The owner of the pond bought 200 channel cat fingerlings approximately 7 years before this one was caught, and they grew at about 2lbs per year. Never though it could possibly be anything else. I'll have to do some more research, and possibly go catch another for comparison!